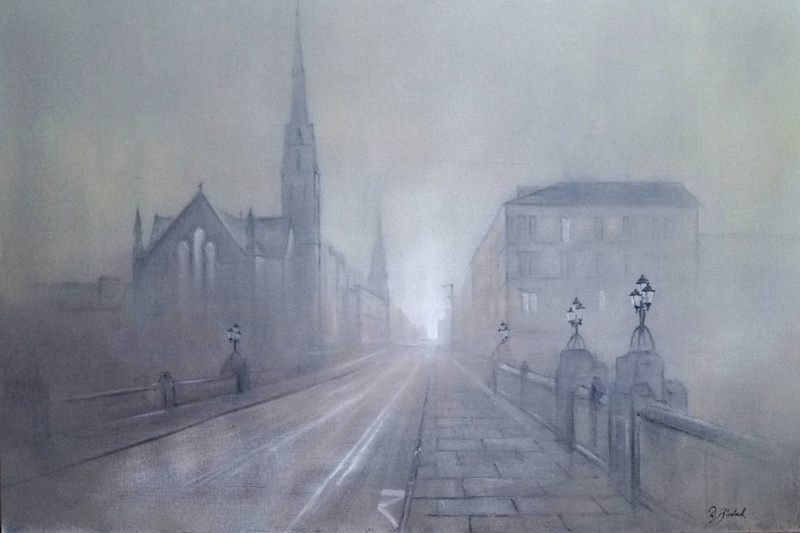 This piece, which I’ve entitled “Glasgow Ghost Town”, is one of my more recent artworks, though an early piece for my journey into the genre of cityscape. Growing up in a very rural, non-populated place has made the city and its life a very intriguing place to me, though in this piece I’ve deliberately cancelled the life out: This, for just one day, is how I would like to experience the city. The noise, the people, the smells – all serve as a huge distraction to really take in the achievements of man, the great architecture new and old, the layout of the city, the vastness of it, it all fascinates me greatly! I speak in my post “Moonlight in Longrigend”[i] of aiming to capture a certain silence, I am doing the same thing here; I am bringing what I know best into a very unfamiliar territory. The silence is what I am used to. It is what I love; the mood and feelings are true to me – which matters most in piece like this as it is not a place that’s true to my heart. To create an honest piece of art there has to come an inner feeling which is not always easy to tap into. I believe I cannot paint the city honestly until I have “bathed in the fountains of its culture.” Couple that with the inner feelings that are true to me and I think I will have great art to share with the world…I hope anyway!